Recent scientific research has revealed that the blue irises in Van Gogh's Field with Irises near Arles were once purple. 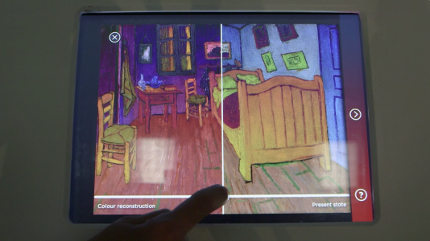 That is because the red is slowly disappearing from Van Gogh's paintings. The discolouration has arisen because the red pigment that Van Gogh used in his paint is strongly deteriorating, conclude the scientists who have investigated Van Gogh's work. They talked about their findings in the Dutch TV programme De Kennis van Nu [The Knowledge of Now] that was broadcast on Sunday 7 December. The research is a joint project between scientists from Tilburg University, the Van Gogh Museum and the Cultural Heritage Agency of the Netherlands. NWO is funding the research through the Science4Arts programme. Senior restorer Ella Hendriks from the Van Gogh Museum is doing research into the painting Field with Irises near Arles that Van Gogh completed in 1888. Using scientific techniques the researchers discovered that the blue irises must once have been purple and that the red paint in the painting is gradually becoming lighter. This is a consequence of light damaging the red paint pigment. The deterioration of the colours has now been described better with the help of computer modelling. Ella Hendriks fears that unless measures are taken the dye will have effectively disappeared within a few decades. A worldwide adjustment of the standards applied to the illumination of paintings might be needed to protect them from discolouration. During the restoration, the paintings will not be restored to the original colour palette. Researchers will however make digital reconstructions of what the paitings would have originally looked like. The simulations can serve as a starting point for determining new illumination guidelines. The involvement of computer scientists in the conservation and restoration of art is a new development. Why look at art and visit museums when what we see has no relationship with what the artists originally intended? 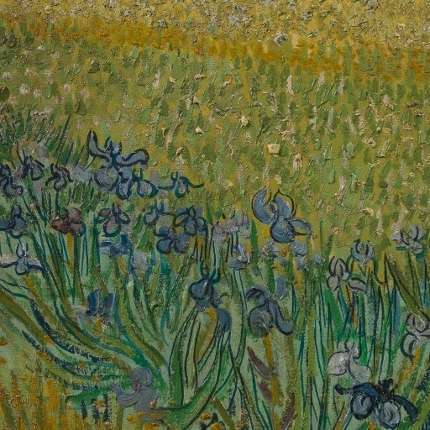 If Van Gogh had meant in 1888 to paint blue Irises, he would have used blue paint. He selected purple: why find beauty in what he did not create?